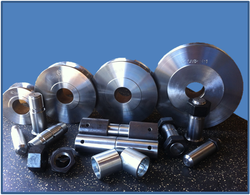 We specialize in rollers and end rolls as well as other trailer parts, custom CNC machining and welding fabrication. Our shop plays host to a wide range of machines that all work to exact specifications. We’re able to do large scale production machining of parts on 10 CNC machines, 13 manual machines, 4 saws and a range of welding equipment. Click HERE to fill out information to receive more information about our products and services. 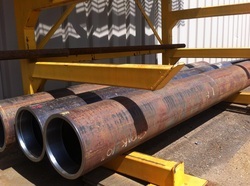 All of our live rolls are made of quality steel ensuring that they are top quality and strong. They are manufactured to the specified length that the customer requires. Each live roll comes with a one year warranty. For a list of sizes that they are manufactured in please click on the image. We carry numerous different rollers from support rollers, to ginpole rollers to jeep rollers all in varying sizes and lengths. For a complete list of details please click on the image on the left. Our standard rigging parts include sheaves and different types of pins including tailboard pins and ginpole cup pins. Our featured trailer product is our removable king pin and sleeve. 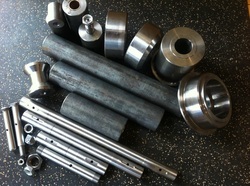 We do however, have other pins, bearings and sleeves that can be custom made. For a complete of trailer parts please click on the image on the left.